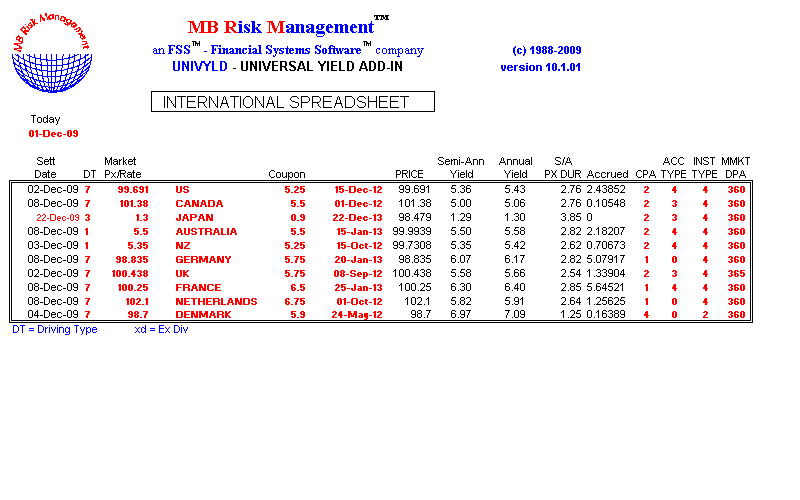 The yield add-in is the finest global yield add-in available. Its lightening speed, range of instruments handled and extensive analytics gives the user a competitive edge. It handles international fixed income products, including MTNs, deferred, long or short first coupon bonds as well as bonds callable between coupon payment dates. In addition to the standard market convention yields, the calculator calculates exact TRUE yields (taking into account weekends and holidays), money market yields on all instruments (which can be compared directly with Libor), forward prices (e.g. 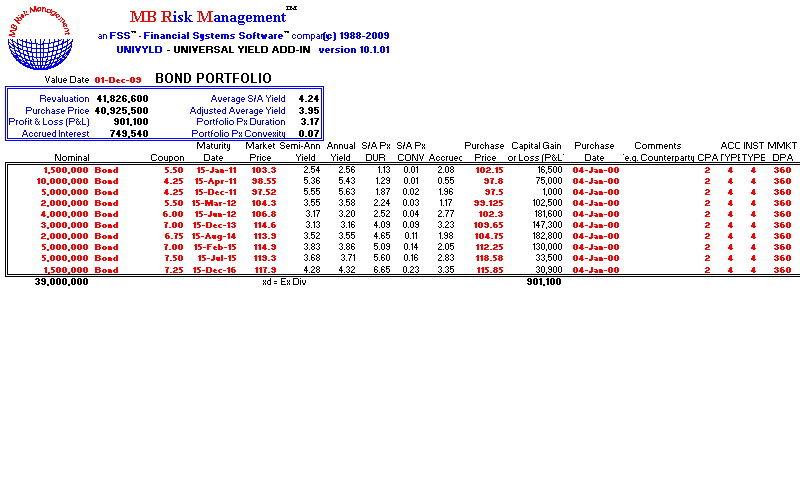 for repos or bond options), hedge ratios and sensitivities (e.g. duration and convexity) consistent for instruments which have a different number of payments per annum (since using 'standard' unadjusted duration numbers could lead to unnecessary risk exposure due to inaccurate hedging), conversion factors to convert from yield volatility to price volatility (or vice-versa), and US Treasury Equivalent Yields on all instruments. 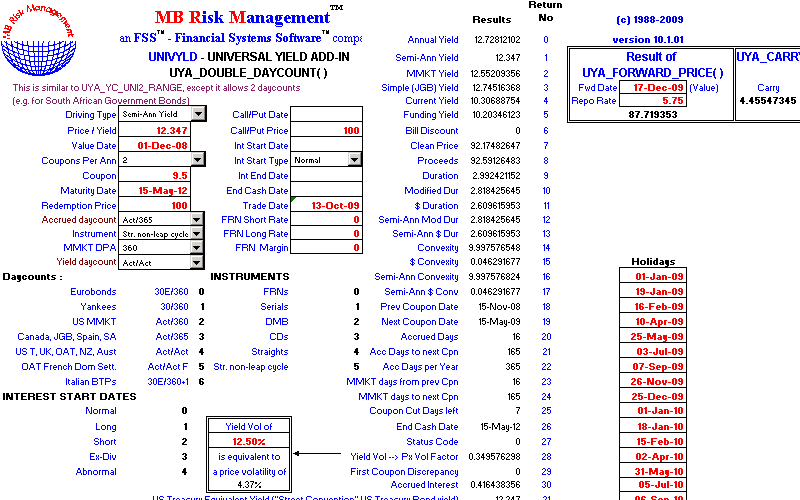 The yield add-in enables the setting up of international fixed income portfolios, with consistent yield, duration and convexity analysis, using your familiar spreadsheet, database or programming language. 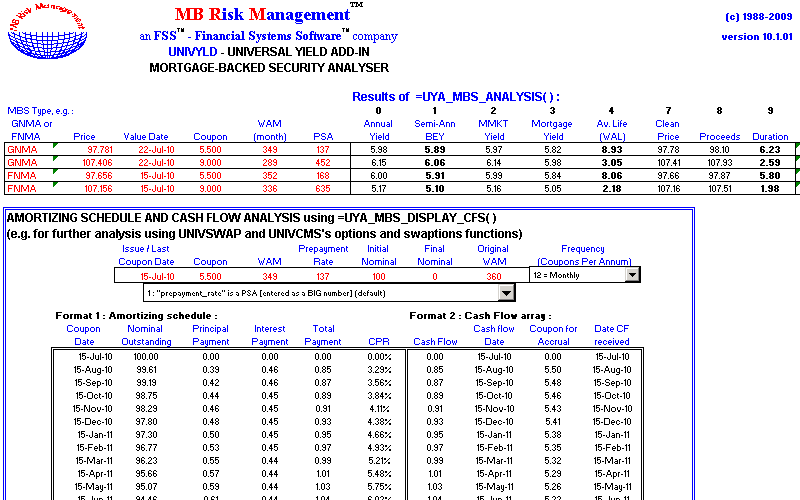 It also has a cash flow analyser for swaps, projects, loans and esoteric instruments. For quantitative analysts, it provides the ability to construct risk/return profiles on arbitrage trades as well as models of bond futures. 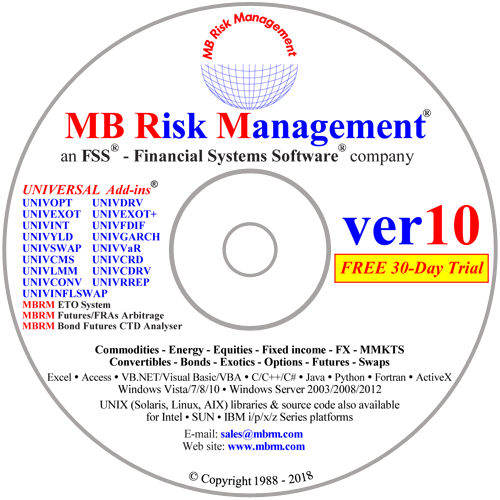 For dealers, it enables the setting up of a very flexible trading system. Its uses are thus endless in the fixed income environment.